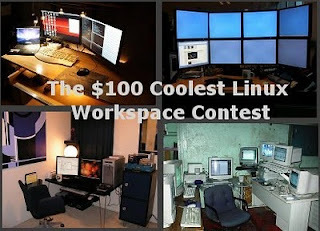 I apologize for the long delay of presenting the finalists of our $100.00 (USD) Coolest Linux Workspace Contest. But, as they say, it’s better late than never. So today, I'm going to present to you the 5 finalists, and we will let our readers and site visitors ultimately decide on who really deserves to win the most coveted price. Note: Voting will end after a month. Good luck! Everyone's favorite GNU/Linux workstation will be their own. Thanks for the nice pictures, there are good ideas in them.